I have lots to get to today, culminating in some good old-fashioned financial analysis. You know, what I was trained to do in college, the CFA program, and 16 years working on Wall Street – until economic collapse and unprecedented government “intervention” all but destroyed my vocation; forcing me into a “second career” in the mining business, which the government destroyed as well; and subsequently, my third – and hopefully, final – career in the bullion industry. Which despite relentless, draconian efforts, the government cannot, and will not, be able to destroy. 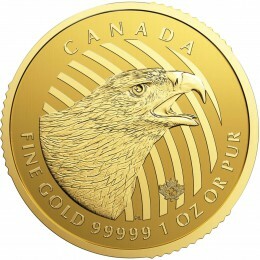 As like Bitcoin, which the Chinese government fallaciously believes it can stop by regulating Bitcoin exchanges, investors have “found a way” to acquire gold and silver throughout history – particularly when their fiat currencies are being serially destroyed; and particularly when governments cheapen their prices via manipulation, as they so blatantly did yesterday. To that end, a perfect case example is what is occurring in India today; where, amidst draconian gold and silver import tariffs; and now, a “cash ban” that has the Indian population living in monetary fear; the Precious Metal black market is not only functioning, but thriving. A topic which, I’ll get to shortly. I’m so excited to present the work I did last night, I’m just going to gloss over the past 24 hours’ “PM-bullish, everything-else-bearish” headlines – like this quote from Marine LePen; who, despite MSM polls still claiming is behind (just like they said the BrExit wouldn’t pass, and Trump wouldn’t win), will likely be “unexpectedly” elected to France’s Presidency in May – on a platform that unmistakably involves an immediate, and unqualified, FrExit. Or how about German Finance Minister Wolfgang Schäuble, flat out saying Greece cannot receive another “bailout” without “reforms” that have never been undertaken; from a nation whose people voted to NOT undertake them 18 months ago; and thus far, haven’t done so, despite countless empty promises? This, as the IMF said Greece not only CANNOT survive such demands, but is headed for a crash course with default. Subsequently, Greek stock and bond prices have plunged to their post-BrExit crash lows – leaving $450 billion of unpayable, soon-to-default debt; and the future of the Eurozone; in the balance. Let’s start with one of my “favorite” topics; i.e., the fraudulent – or at best, patently futile – OPEC “production cut.” Which, barely a month into its enactment, has produced little, if any, change in the historic glut that caused crude oil prices to plunge to $26/bbl last year. That is, until the ad hoc formation of the “oil PPT” – to support, via “propaganda and manipulation,” the industry with more precipitously positioned debt attached to it, than essentially all others combined. For anyone who mistakenly believes $50/bbl is “good” for the E&P industry – which compared to $26/bbl, may seem so; take a gander at this article from Steve St. Angelo, depicting how the world’s largest producers are getting destroyed by $50 oil. And trust me, it’s no coincidence that just as Saudi Arabia announced the underwriters for its planned 2018 IPO of Saudi Aramco – to raise $100 billion, in what will be history’s largest IPO – said “oil PPT” showed up to yet again prevent oil from falling below $50/bbl, on the heels of the publication of the aforementioned, horrifying U.S. production and inventory data. I came across, in perfectly “coincidental,” harmonious fashion, the latest MUST WATCH presentation from Grant Williams, “Get it? Got it? Good.” In it, he details a series of intertwining political and economic events of the past five years, leading to his well-thought out conclusion that not only is the Petrodollar standard on its way out, but that gold may play a part in replacing it. Which in turn, represents yet another nail in the Fed’s coffin, given that the explosion of foreign U.S. Treasury selling that has already started en masse, will only accelerate further in the coming years; in turn, yielding the need for “moar” monetization. Let alone, if Trump gets his wish to blow out America’s debt and deficits further, by cutting taxes to finance spending on non-revenue producing projects like “re-building” the military, closing our borders, and repairing bridges and roads. Much less, if accompanied by paralyzing import tariffs, “border adjustment taxes,” and other anti-competitive trade regulations – like those that created, and extended, the Great Depression. Which brings me to the “supply and demand” portion of today’s topic – which in all cases (such as crude oil), depict the gross; and in many cases unprecedented; imbalances caused by four-plus decades of money printing, predatory lending, and financial engineering. Such as, for instance, the U.S. agricultural industry; which, per this horrifying, MUST READ article, is on the verge of collapse. Which I assure you, no amount of propaganda can change; and certainly, no amount of market manipulation. There’s “Dr. 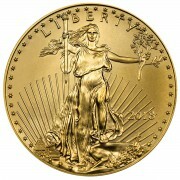 Copper,” one of the most industrially sensitive metals. Which, per the prime tenet of today’s fallacious – and internally inconsistent – “Trump-Flation” meme, is supposedly witnessing rising demand, ahead of Trump’s aforementioned fiscal spending expansion – that has not even been proposed yet. Let alone, approved, as a potentially cataclysmic debt ceiling debate stands squarely in its path. 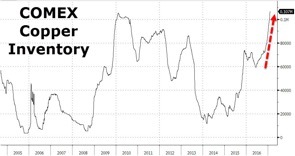 This, atop the inconvenient truth that China’s historic “ghost city” building explosion, over a period of more than a decade, ended with copper prices barely above their post-2008 financial crisis lows. And for anyone claiming that surging demand is sopping up said “supply storm,” what part of record-high copper inventories suggests this? 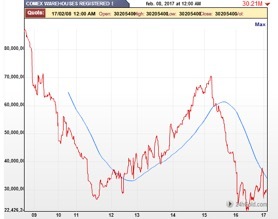 To that end, incorporating the “propaganda and manipulation” segment of today’s title, how laughable is it that, per Zero Hedge’s article title earlier this week, “copper jump(ed) ahead of a strike at the world’s largest mine?” Kind of like oil “jumping” when an OPEC member reiterates, for the thousandth time, a pledge to cut production – despite the aforementioned, horrific supply/demand fundamentals that even OPEC admits have not improved. Which I kid you not, on queue as I’m editing, just occurred again! This, as global demand is surging, as depicted by the below explosion of physical buying by ETFs such as XETRA gold. 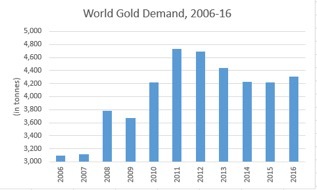 Here’s a chart of world gold demand, going back the past decade. As you can see, it ended 2016 just 8% below the record high of 2011. Not bad, considering that, due to unprecedented “propaganda and manipulation,” “dollar-priced gold” is roughly 35% below the 2011 high. Then again, in the vast majority of non-reserve currencies – representing the vast majority of global physical buying – gold is either near, at, or in many cases well above previous all-time highs. Of course, there’s that little matter of the aforementioned “black market”; where countless tonnes of unreported purchases occur – for a variety of reasons, including capital controls, tax evasion, and privacy. And nowhere more so than in India; which, since draconian import tariffs were introduced in mid-2013, has seen an explosion in black market trade – which I assure you, will only increase further in 2017 and beyond, now that Modi’s “cash ban” has the entire nation living in monetary fear. 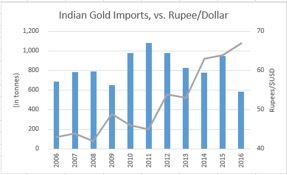 Here’s a chart of official Indian gold imports over the past decade, compared to the exchange rate of the Rupee – which this year, fell to its lowest-ever level, amidst the most fiat-currency-hating citizenry on the planet. Thus, if gold smuggling was estimated to be 200 tonnes in 2013, I can only imagine what it is now – and what it will soon become. To that end, it’s entirely possible that much of the aforementioned gap between 2011’s record worldwide demand and 2016’s level, just 8% lower, has already been made up for by black market trade. 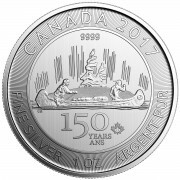 And then there’s silver, who’s “supply and demand” fundamentals are not only stronger than gold, but essentially all other commodities – care of the unprecedented “propaganda and manipulation” that have suppressed prices to, for the vast majority of global miners, significantly uneconomic levels; particularly when considering “all-in” costs, including exploration, development, permitting, and oftentimes draconian, arbitrary, host government taxation. Which, again utilizing Steve St. Angelo’s myriad analytical talents, could not be more bullish. Recall the aforementioned discussion of how copper “surged” on news that the world’s largest copper mine might simply go on strike; as opposed to the catastrophic depletion of the world’s largest silver mine – which unlike a strike, is permanent. 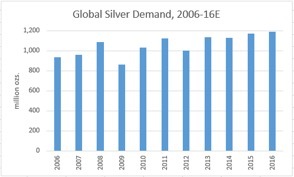 We have the incredible fact – demonstrating just how strong silver’s monetary and industrial demand is – that despite prices being 65% lower than the 2011 peak; and not much better off in other currencies; global silver demand hit an all-time high in 2016. 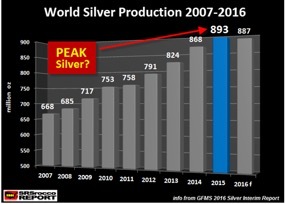 This, as global silver production certifiably, like gold, peaked. 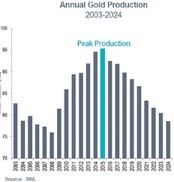 And by the way, please note that compared to copper, which saw global production rise by a whopping 50% from 2007-16, silver production only rose 33%. The only statistic that really matters is inventory, which incorporates the net effect of supply and demand changes. 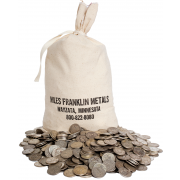 Which, in the case of copper, not only sits at an all-time high as we speak; but according to Goldman Sachs, will likely rise further in 2017, due to the aforementioned, oncoming “supply storm.” This, compared to essentially record-low available-for-sale inventories of silver – down 65% from the pre-2008 crisis highs, to barely $500 million dollars’ worth on the New York COMEX. After which, amidst an historic Cartel campaign of “propaganda and manipulation,” an unprecedented physical demand rush ensued.